Hug it Forward utilizes the enthusiasm of humanitarian volunteers to build eco-friendly schools in Guatemala. A single “bottle school” for a community can be built for around $9,000, and 100% of all donations are spent directly on the schools. The reason they are called “bottle schools” is because the walls are built out of wasted trash bottles stuffed with inorganic trash. The bottles serve as your ordinary cinder block, and the “eco-blocks” are arranged between chicken wire and then covered by cement. 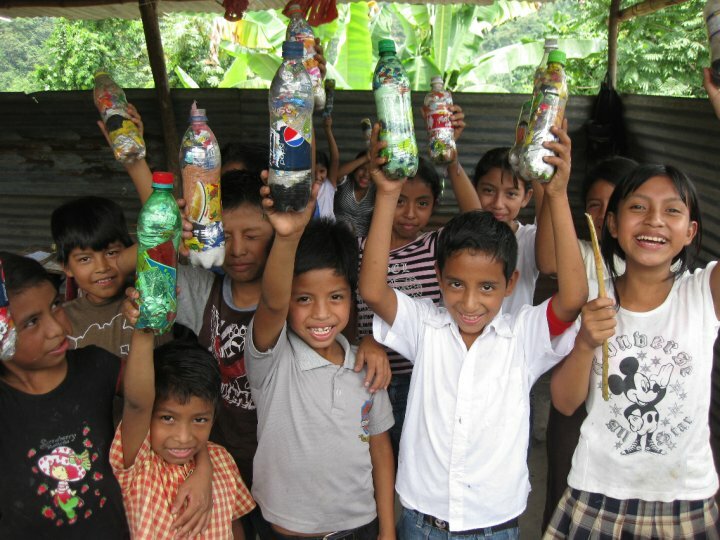 According to their website, Hug it Forward’s first project in Granados, Guatemala (in October 2009) used over 5,000 plastic bottles to build two classrooms, containing 2053 pounds of trash, using 9720 pounds of cement. 297 children and youth currently attend the school, which serves a municipality of 13,860 people throughout 95.75 square miles. Providing much needed schools – and because “waste” plastic is being used, “upcycling” is cheaper than the usual ways of building. Cleaning up the community – Getting trash out of the streets, air, water and land means less contamination, healthier people and a more attractive environment for tourism. Environmental education – Kids in the communities where bottle schools are being built learn about the impact of non-biodegradable plastic. At the same time, people who hear about bottle school projects become educated as well. Community ownership – Everyone is involved, from little kids collecting trash to moms stuffing bottles to dads volunteering on the construction site. Mass involvement – Thousands of people are coming together to make this happen: kids, parents and surrounding villages, networks of volunteers, huggers and people raising funds in lots of different ways. A real example of the world working together as ONE people. All photos were taken from the Hug it Forward website and Facebook. Find a whole gallery of their projects on the Hug it Forward facebook page! This entry was posted in Culture, Design, Education, Environment, Take Action, Video and tagged activism, bottles, community, education, Guatemala, Hug it Forward, humanitarianism, involvement, Manifest Foundation, non-profit, one love, projects, San Diego, schools, trash, unite, volunteer, waste. Bookmark the permalink. We are now approaching the completion of our 7th Bottle School, in the community of Las Mananitas on the Pacific Coast of Guatemala. Can u tell me about the bonding characteristics with cement of bottle.? What are the other disadvantages? Hey Kavya, I am not an expert in the field and want to provide misleading information to you. However, this website may be able to help you: http://www.journals.elsevier.com/construction-and-building-materials/recent-articles/. Hi Kavya! I am a member of the Hug It Forward team and I wanted to reply to your question. The cement bonds with the metal rebar that is inside the cement columns, it doesnt bond with the bottles :). I would also love to refer you to our bottle school manual wiki for more information: http://www.bottleschools.org/wiki/Main_Page. Thank you so much for your interest!